One of the features of the GFC's custom Gryphon plane is it's ability to stack boxes. By using specially scripted boxes you can fly over one, type "lift" in the chat window and it will be attached to your ship. To drop simply type "drop". Sigma squadron now host a weekly event on Fridays at 11am SLT, last week it was using the gliding feature of the gryphon to turn off the engine and try to direct your decent on inertia alone, which was a fun and challenging event. This week it was the turn of crate stacking.The attending pilots all gave it a try, the host of the event Sigma Squad Leader Richardjrn Weatherwax laid down tons of crates and we flew over picking them up one at and time to see how many we could stack. On average people were stacking around 4 crates before gravity took a hold and it all came crashing down to the ground. Snapper Desade that super pilot of the skies (in his permanent deluded state) managed the incredible feat of placing 17 crate boxes on top of each other before they were sent sprawling to the floor. 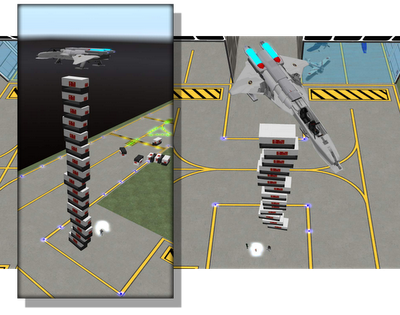 I'm sure stacking will be brought back as a fun activity for pilots and I'm sure various records will be attempted.